The Atlanta Center for Creative Inquiry was initiated in 2004 by Oscar Harris, CEO of Turner Associates/Architects & Planners, Inc., one of Atlanta’s leading architectural firms, and a Carnegie Mellon alumnus and trustee, in partnership with Georgia Institute of Technology and Benjamin E. Mays High School. 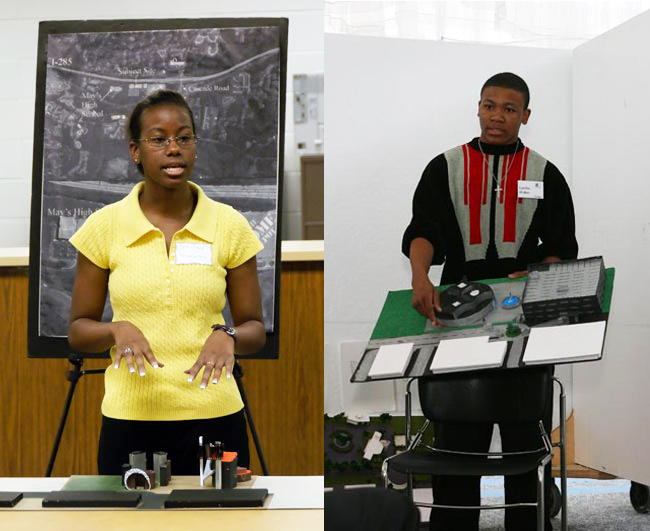 Envisioned as a demonstration project to introduce minority high school students to architecture and design, it was modeled after the Sustainable Landscape and Architecture Project, hosted in the STUDIO in 2000-2003 and created by S.K. Woodall. The Atlanta program began with 15 students in a six week program that included presentations by architects and faculty and graduate students from Georgia Tech. The curriculum introduced students to college architectural course work. The program has progressed and attracted sponsors and new students. The Atlanta public school system provides transportation so that students can travel to field trips that include tours of architecture firms led by African American principals, and construction sites. The teaching is focused on drawing on students’ creative and conceptual thinking, and presentation of ideas in architecture. They draw, design and make models and are challenged to imagine a design for their community. The program and its director are committed to increasing public awareness of architecture as a profession and to expanding pathways to the field for minority youth.